The 30-year-old, a two-time English UBBF champion, lost out on a split decision to his former Muscle House Gym sparring partner but gained the respect of his nemesis with a gritty and determined display. Wheeldon, a former English bare knuckle champion at middleweight and a former UBKB British cruiserweight king, had Devlin down in the second with a thumping right hook to the temple but he was forced to dig his claws in to stay ahead on the scorecards thereafter. "I'm in perfect health," Devlin confirmed. "It was a good fight, it went well, but he had me down in the second round. "He thought it was going to be over in one round but I think I won over everybody's hearts with that performance. "I saw his face, I could see it in his eyes, one more round and he was finished. I'm not a three-round fighter, I still had another three or four rounds in the tank. "I'm not disrespecting him, the worst thing you can do in this industry is take away a man's victory and dishonour him, but the pictures spoke volumes. They told their own tale. I may not have won the fight but I won the war." The Padiham gladiator is renowned for having one of the best jabs in the business, a weapon he was reliant on over the three two-minute rounds, but the disappointment lay in the redundancy of his back hand. 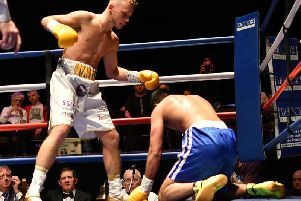 Devlin said: "I utilised my jab well, which inflicted some damage. I've got one of the best jabs in the game. "I wanted to heighten the aggression but he dropped me with a beautiful right hook and that knocked me back in to second gear. "It was a flash knock down, he landed right on the temple, and I got up at nine. I think that was the defining factor in a fight that I was told was 'razor close'. "I thought I under-performed on the night which is why I'm taking a lot of positives from it. I didn't let my back hand go enough. I respected his power, I felt it and that made me quite tentative." The former St Augustine’s RC High School pupil is still a relative novice in this game - that was only his fourth bare knuckle contest - but it's a challenge he's relished since being taken under promoter Shaun Smith's wing. "I was a heavy underdog, I got in to this game because I'm a fighting man," he said. "Self-preservation doesn't exist in my repertoire. The concept of defeat doesn't faze me, I want to test my psychological and physical limits. "I love testing my mental fortitude. I like the art of war; it appeals to my nature. I just enjoy pushing the boundaries."